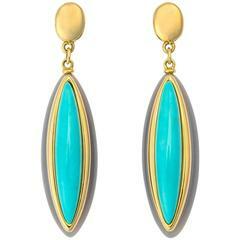 The perfect drop earring. 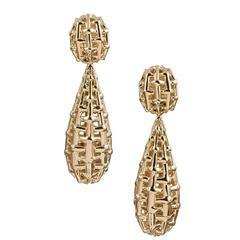 Seaman Schepps skillfully weaves rich 18k gold to create this classic drop earring. 1 1/2 inches in length. Seaman Schepps Cage earring is a true classic. Rock crystal offers a bright neutral easy to wear earring thats simple and chic. 26mm x 20mm A perfect 1 inch size. A Seaman Schepps Classic. Beautiful adventurine is custom cut and paired with rich 18k gold. 1 1/8 X 5/8's of an inch in size. 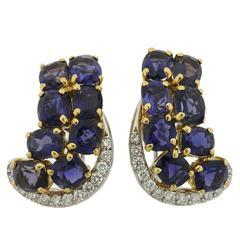 A pair of 18k white gold earrings set with iolite and diamonds. 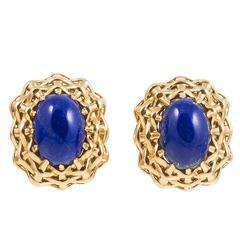 The earrings measure 31mm x 21mm and weigh 19.6 grams. Marked: SEAMAN SCHEPPS, 750, P10092.